L.A. Playwrights, Actors, Directors and Producers: Join us on Sunday afternoon, September 15, at the Zephyr Theatre (7456 Melrose Ave, Los Angeles), for our second season Kick-Off, including an overview of plans for the 2013-14 Monday Night PlayGround staged reading series and Best of PlayGround and how you can participate (Actors: General Auditions will take place earlier in the day; check our Facebook page or with Actors' Equity Association for details). Doors open at 4pm and the Kick-Off will begin at 4:30pm. Come meet the artists who paved the way in our inaugural season last year, hear first-hand accounts about their PlayGround experience and watch a performance of one of last season's award-winning short plays. We'll also announce the schedule of monthly topic announcements and evenings of short play staged readings. To RSVP for the Kick-Off, join our Facebook event at https://www.facebook.com/events/157047737830896/ or email to info<at>playground-la.org. After the Kick-Off, stick around for a special one-night-only screening of the second PlayGround Film Festival, featuring six short films adapted from short plays originally developed and premiered through Monday Night PlayGround and the Best of PlayGround Festival (including Geetha Reddy's LA Shorts Fest selection, Obit). The screening begins at 6pm and has a running time of 75 minutes. General admission tickets are $15 ($20, priority seating; $10, student admission). To purchase tickets, visit http://playground-la.org/boxoffice.shtml. SPECIAL OFFER: Purchase a 2013-14 Monday Night PlayGround 6-Admission Pass and receive a complimentary ticket for the one-night-only PlayGround Film Festival screening on 9/15. PlayGround-LA is a leading Los Angeles playwright incubator and theatre community hub, and producer of Monday Night PlayGround, a monthly script-in-hand staged reading series featuring original short plays written in just four-and-a-half days by Los Angeles’ best new dramatists and inspired by an assigned prompt. Ten days before the designated Monday, a topic is announced (some of last year's topics include "Origin Story," "I Have A Dream," and "Star-Crossed Lovers") and emerging playwrights in the Greater Los Angeles Area have until 2pm the following Tuesday to submit a short script. A panel of judges selects six winners, whose entries are cast over the weekend and then rehearsed with the area’s best professional actors and directors in a whirlwind ninety minutes each before being performed as script-in-hand stage readings at the Zephyr Theatre on second Mondays, October through March. PlayGround-LA concludes each season with a one-night gala in May, recognizing the top writers and short works through the Best of PlayGround. The mission of PlayGround-LA is to support the development of significant new local voices for the theatre. 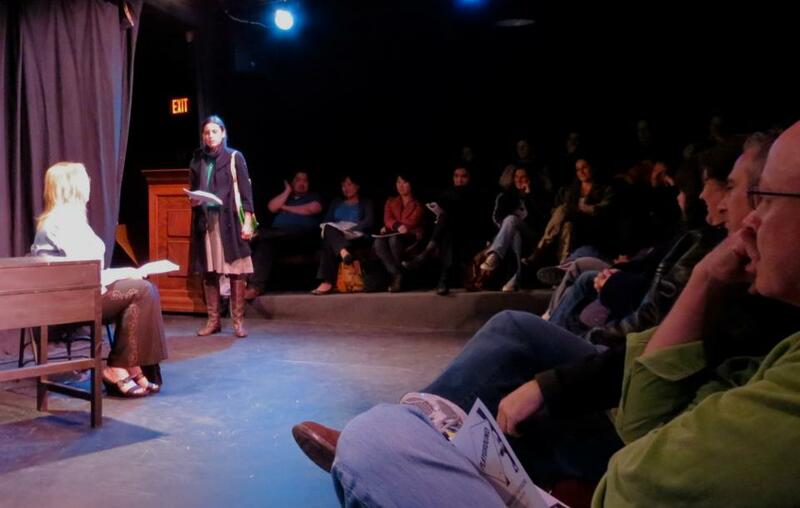 More than just a play development program, PlayGround focuses on the creation of a true theatre community by nurturing the collaborative process between first-time or early career playwrights, and established professional actors and directors. With a particular focus on the ten-minute form, PlayGround-LA creates a microcosm of the greater theatre scene, allowing for experimentation and risk-taking as well as the honing of style and technique. PlayGround-LA is the first national expansion of the San Francisco-based playwright incubator, PlayGround. Launched in 1994 by co-founders Jim Kleinmann, Brighde Mullins and Denise Shama, PlayGround has developed more than 650 original ten-minute plays and 48 full-length commissions. In the process of staging those works, PlayGround has helped to identify some of the leading emerging writers and, at the same time, has engendered the creation of a true community of theatre artists, bringing together hundreds of local actors, directors and playwrights. PlayGround’s alumni have gone on to win local and national honors for their short and full-length work, including recognition at the Humana Festival, Sundance Festival, Bay Area Playwrights Festival, New York International Fringe Festival, Aurora Theatre Company’s Global Age Project, and Samuel French Off-Off Broadway Short Play Festival, among others. For more information, visit http://PlayGround-LA.org or follow PlayGround-LA on Facebook (http://facebook.com/PlayGround.LosAngeles) and Twitter (http://twitter.com/PlayGround_LA). PlayGround-LA is a fiscally-sponsored project of PlayGround (Federal ID 94-3336399), a 501(c)(3) California nonprofit corporation. All contributions to PlayGround-LA are tax-deductible to the extent allowed by law.